DumpsOwnerArmando MedinaVehicle’59 Chevy ImpalaCity/StateSan Diego, CaliforniaClubIndividuals C.C.Armando Medina has been traveling across the U.S. showing his detailed ’59 Impala convertible. That’s how Armando hooked up with Chad Furman AKA “Mr. Hard-line.” Chad has built a few custom setups and caught Armando’s attention.After talking to Chad, Armando knew that he had to have him build a custom setup for his ’59. It took Chad six months, but the wait was well worth it. The custom setup consists of four Pitbull Hydraulics pumps fitted with 1-inch side pressure and 1/2-inch top return blocks, which always make you take a second look at the pumps. 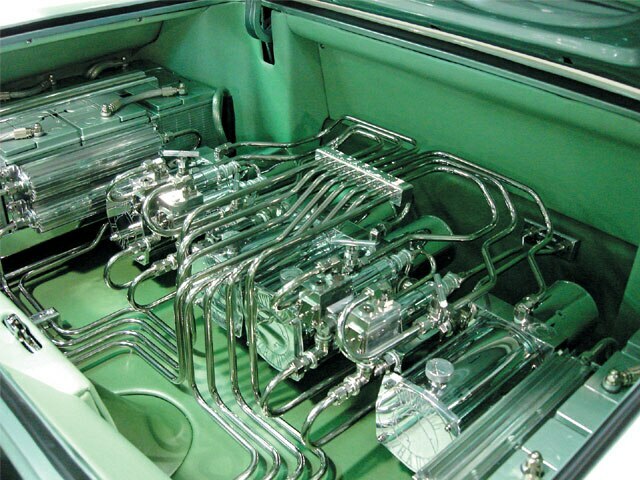 The setup was equipped with four Adex chrome dumps plumbed in stainless steel Parker fittings that ensure accuracy every time.The eight-battery setup was hard-lined in 1/2-inch tubing and was designed with intricate patterns that are uniform throughout the trunk. The trunk was upholstered by Jeff Rhodes, who used material that matched the interior kit, and is highlighted with oil coolers and custom battery tie-downs that bring a little bit of the exterior chrome into the trunk.This setup would not have come together if Armando wouldn’t have hooked up with his buddies “Pando” and Brent of Pitbull Hydraulics. Armando’s trunk is going to give a few people a run for their money as this setup can be considered immaculate. BumpsOwnerVernon “V-Max”Vehicle’61 Chevy ImpalaCity/StateNorco, CaliforniaClubUltimate Riders C.C.”V-Max” is no stranger to the game, having had a few cars in the magazine. This time around, he’s doing his thing with this ’61 Impala convertible. 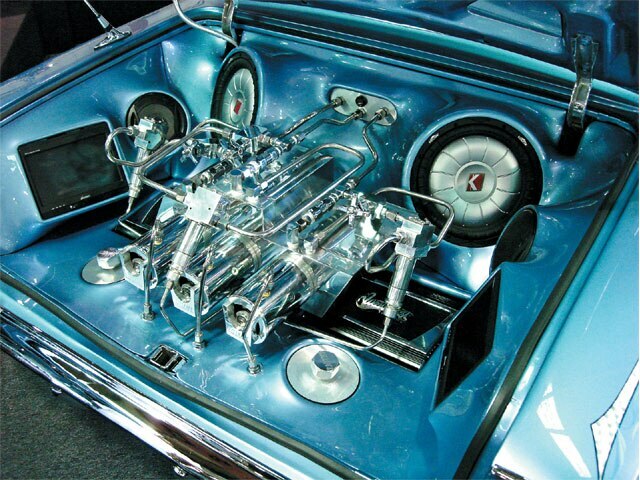 The custom ’61 has a lot of tricks, but it was the sound system that caught our attention.People who work on cars just keep getting better at it, and that can be said about V-Max. His latest ride features a custom setup and sound system. Jeremy and “Bear” made all of the moldings and panels, and then V-Max’s painter, Louie, painted the panels to match the exterior of the car.Once everything was dry, they installed two 12-inch Kicker subwoofers powered by two Orion amplifiers. These amps push the six pairs of 6 1/2-inch midrange speakers that are mounted throughout the car. The trunk has two 10-inch screens incorporated into the side panels.This complete trunk setup took V-Max two months to build and incorporates a custom hydraulic setup to complement the sound system. We’ll have to see what else V-Max comes up with in the near future as he’s ready to build another custom Impala.